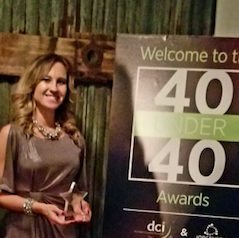 Jessica Hamilton, Lee’s Summit Economic Development Council’s Director of Community and Investor Relations, has been selected as a winner in the economic development profession’s 40 Under 40 awards, the only program of its kind recognizing young talent in the economic development industry. An independent five-member selection committee chose winners from more than 170 qualified candidates based on their accomplishments and contributions to the economic development industry. The program was managed by Development Counsellors International (DCI), a New York-based firm that specializes in economic development marketing, and Jorgenson Consulting, a leading national executive search firm serving organizations in economic and community development industries. Since joining LSEDC two years ago, Hamilton launched several successful programs, including HR Roundtable, local National Manufacturing Day activities, and an online hiring portal to connect local businesses with potential employees and interns. DCI and Jorgenson officially announced the winners Sunday night at an awards reception during the International Economic Development Council Leadership Summit in Fort Lauderdale, Florida and will feature profiles of each on the awards website. For more information on the 40 Under 40 winners, visit econdev40under40.com.